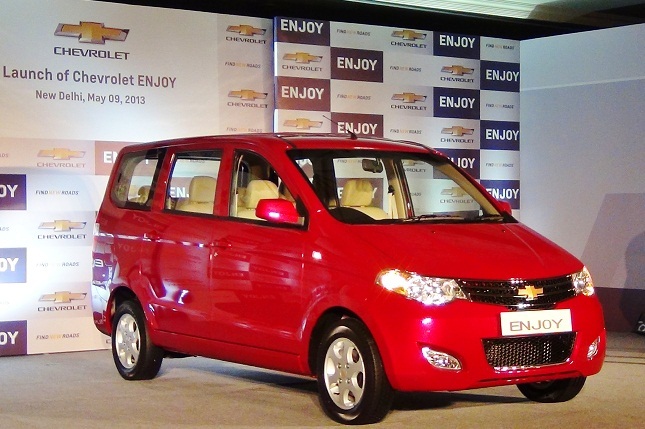 Chevrolet launches Enjoy MPV, prices it brilliantly between Rs. 5.49 lakh and Rs. 7.99 lakh! 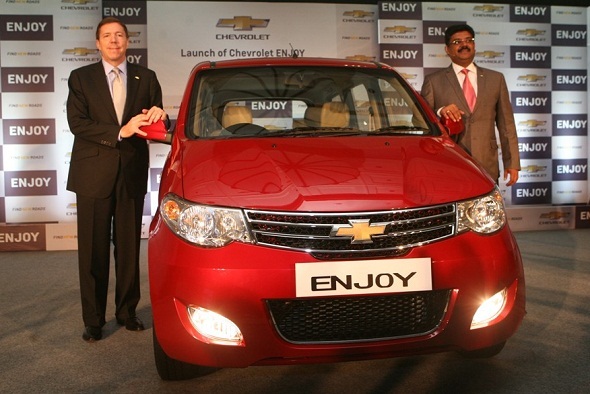 Chevrolet has launched the much awaited multi-purpose vehicle, the Chevrolet Enjoy at a starting price of Rs. 5.49 lakh going up to Rs. 7.99 lakh, ex-showroom Delhi. It is available in eight variants, four in petrol and four in diesel. At that price point the Chevrolet Enjoy is very attractively priced, as it is cheaper than the Maruti Ertiga by about Rs. 50,000 on the base variant and over Rs. 70,000 on the top-end variant, and yet provides far more space than the Ertiga. If you compare it with the Mahindra Quanto’s price as well, the Enjoy is just slightly more expensive than the Mahindra Quanto – but again wins hands down on space and comfort. This is one vehicle that actually has a very usable third row, which can seat three abreast with enough legroom for all. The second row consists of individual captain seats with armrests that are just as comfortable as the front two seats – if you are looking at a chauffeur driven vehicle, this will definitely appeal to you. Luggage space is about 190 litres with all three rows in place, which means you can only place a couple of shopping bags behind the third row. But flip-folding the third row of seats, converts this vehicle into a comfortable four-seater with a humungous 630 litres of boot space! It can hold a bicycle, a couple of large suitcases and the kitchen sink if needed! Remember the Nissan Evalia’s space? This is just as good. The Chevrolet Enjoy has a really attractive entry-price point for the petrol variants, which may wean some sedan buyers or Maruti Ertiga MPV buyers to it. 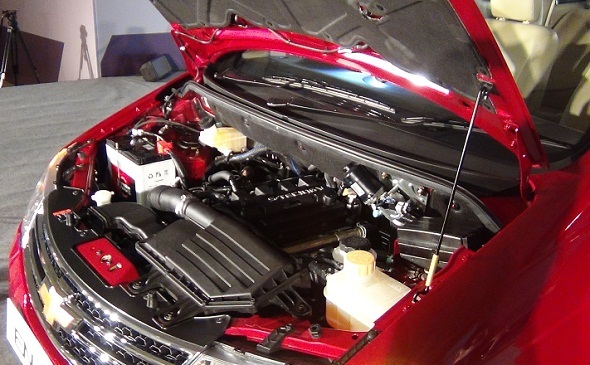 The 1.4 litre petrol engine puts out 102 bhp (104PS)of power at 6000 rpm and 131 Nm of torque at 4400 rpm, mated to a five-speed manual transmission, driving the rear wheels. The petrol engine has a claimed fuel efficiency of 13.7 kmpl (ARAI certified), which isn’t really that great. Speaking of low running costs, General Motors has thrown in a three-year or 45,000 km maintenance package that costs about Rs. 24,000 with the Chevrolet Enjoy – and this covers all service charges, all consumables such as oil, filters etc, as well as clutch plates, brake pads and other wear and tear items! The vehicle also comes with a three-year, 100,000 km standard warranty. This is sure to be an important factor in buying decisions. The LT and LTZ variants also get an integrated music system, fog lamps, rear defogger, rear wiper, parking sensors, key less entry among others. The top-end LTZ variants of the Chevrolet Enjoy also come with two airbags and ABS, as well as power adjustable mirrors and alloy wheels. All variants get power windows and rear-roof mounted AC.